We open with the Stranger and Blue Devil in a confrontation with the Black Lantern Spectre. Their goal: to draw the real Spectre out, and to prevent the BL Spectre from going after Hal Jordan. Why? Who knows? Our stoic Stranger does, but it seems all will be revealed in due time. The Stranger’s esoteric clue-dropping drew me in, but I was highly irritated by Blue Devil’s rude one-liners. I mean, the Stranger doesn’t show up all the time, so can you just shut your pie hole and do what he says?! Please, and thank you. The art in the first section of the book is detailed — sometimes too detailed. In certain panels, the Spectre’s muscles are so overly defined that it looks like he doesn’t even have skin, let alone clothes. I know the characters are ripped, but this was a bit much. In the panel where BL Spectre has a “Squirrel!” moment and abruptly leaves to find Hal, the proportions are all off. He looks like a giant with midget arms who’s burying himself — backward. From there, our odd duo goes looking for Deadman. Where? Nanda Parbat. “How perfectly obvious,” muses the Stranger. Since I love me some Nanda Parbat and think it’s a super-cool concept, it was exciting to see it incorporated into the story. 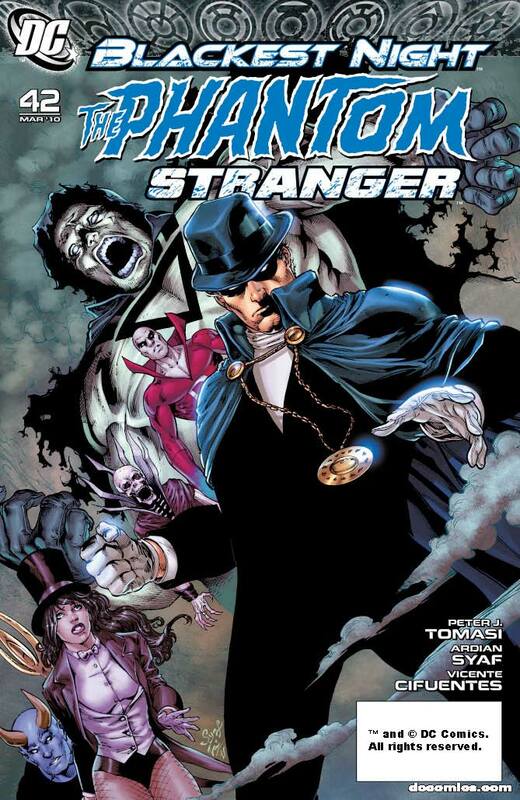 The Phantom Stranger tells Deadman he has a great destiny to be fulfilled, but he must reconcile his spirit with his body and get his remains safely inside the city walls. With the help of the Stranger, Deadman battles to possess his corpse. Here we get to see some interesting panels, especially when BL Boston Brand tries to invade the body of The Phantom Stranger. It really gives you a feeling for how vast the Stranger is as a character. Deadman finally manages to get that nasty black ring off his corpse and safely stores his body. Then he flies off to warn Hal of what he learned from the Black Lanterns while fighting for his body. The art in the second half of the book really worked in each scene, perhaps because Syaf didn’t have a giant Black Lantern to draw. It seems like he does better with fine detail than grander images. The color palette — a lot of blues and grays with extra shadowing — worked great for the characters and the mood of the story. Apparently, Deadman was featured in Phantom Stranger #41 back in 1976. Being that Deadman has played his part in Blackest Night up to this point, his being in this issue was rather perfect. DC’s concept of raising certain titles from the dead is a good one, and it meshes well with who the Phantom Stranger is. “The Stranger comes when the Stranger is needed.” I get the impression that the Stranger has done what he felt he needed to do, as did this issue. This wasn’t a typical read for me, but I’m a fan of Tomasi’s writing and have always been intrigued by the Phantom Stranger. The story was interesting and succinct, and it piqued my curiosity about all the things the Stranger alluded to. I think my expectations for this issue were too high. It wasn’t bad, but I guess I thought there would be more revelations to the true nature of Nekron, the Spectre, or whatever. I liked the one-panel allusion to the Phantom Stranger’s three separate origin stories. That was very cool. YES! That one-panel allusion was very cool. My favorite of the entire book. You are right, there really was not much in the way of revelations. I think that would have been more rewarding. But plenty of build up. I guess Johns wants to save all the reveals for the last couple issues of Blackest Night. Yeah, I think you’re right, and I think it was sort of foolish of me to expect some big revelation to take place in a one-shot. I got all excited when the Phantom Stranger was mentioned in one of those Book of the Black excerpts in the back of one of the Blackest Night issues and assumed that the payoff would be here.